Macaroons. Or is is Macarons? Parisian macarons, astute Slate readers have surely noticed, are everywhere—not only in French-style patisseries but also at such mainstream purveyors as Trader Joe’s. Here in San Francisco, we have macaron delivery, and even the Wall Street Journal has noticed the trend. Why these cookies have become so popular is a matter for another day, but their ubiquity suggests another question: What, exactly, is the relationship between the delicate French almond macaron and the less fashionable, dense coconut macaroon consumed at Passover? And why do these words sound so much like macaroni? In Sicily (and in Toledo, Spain, another contact point between Muslim and Christian culture) fālūdhaj and lausinaj developed into various desserts, like the almond-paste tarts called marzapane and caliscioni. The 1465 cookbook of Maestro Martino tells us that marzapane was originally a pastry casing filled with a mixture of almond paste, sugar, rose water, and sometimes egg whites. While the modern word marzipan now means the filling, the name originally described the casing; marzapane comes from the Arabic word mauthaban that meant the jars the candy came in. Caliscioni was a tart made by layering almond paste over a layer of sweet dough made with sugar and rose water. The pasta and the almond-pastry traditions merged in Sicily, resulting in foods with characteristics of both. Early pastas were often sweet, and could be fried or baked as well as boiled. Many recipes from this period exist in both a savory cheese version and a sweet almond-paste version that was suitable for Lent, when neither meat nor cheese could be eaten. The almond pastry caliscioni, for example, had both almond and cheese versions, and in fact is the ancestor of the calzone. Out of this culinary morass arises, circa 1279, the word maccarruni, the Sicilian ancestor of our modern words macaroni, macaroon, and macaron. We don’t know whether maccarruni came from Arabic or derives from another Italian dialect word. But like other dough products of the period, it’s probable that the word maccarruni referred to two distinct but similar sweet, doughy foods, one resembling gnocchi (flour paste with rose water, egg whites, and sometimes sugar, served with cheese) the other more like marzipan (almond paste with rose water, egg whites, and sugar). The earliest recorded examples of maccarruni (or its descendent in Standard Italian, maccherone) refer to pasta. Boccaccio in his Decameron (around 1350) talks about maccherone as a kind of hand-cut dumpling or gnocchi eaten with butter and cheese. Fifteenth-century cookbooks tell us that Sicilian maccherone was made of white flour, egg whites, and rose water, and was eaten with sweet spices and sugar, butter and grated cheese. We see in the Washington recipe the rose water and musk of its medieval Arab antecedents. Even as this recipe was being written, however, modern French cuisine began to evolve out of its medieval antecedents, as cooks replaced imported medieval spices with local herbs. Get a pound of shelled almonds, set them to soak in some cool water and wash them until the water is clear; drain them. Grind them in a mortar moistening them with three egg whites instead of orange blossom water, and adding in four ounces of powdered sugar. Make your paste which on paper you cut in the shape of a macaroon, then cook it, but be careful not to give it too hot a fire. When cooked, take it out of the oven and put it away in a warm, dry place. Distinct French recipes for La Varenne-style macaroons developed in places such as Amiens, Melun, Joyeuse, and Niorts, and in many convents, where they became a specialty by the 18th century. 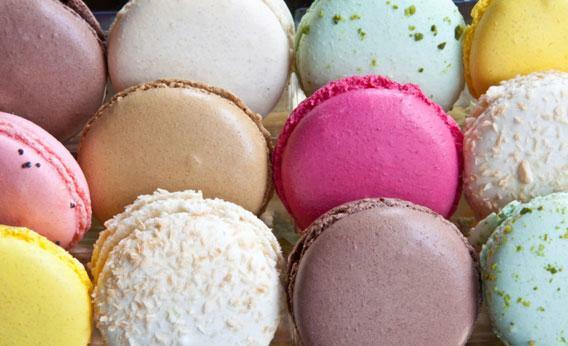 After the French revolution, macaroons were commercialized by sisters leaving convents and starting shops such as the Maison des Soeurs Macarons in Nancy. [A] small, round biscuit (cookie), crunchy outside and soft inside, made with ground almonds, sugar and egg whites. COCOANUT MACAROONS – To one grated cocoanut add its weight in sugar, and the white of one egg, beaten to a snow; stir it well, and cook a little; then wet your hands and mould it into small oval cakes; grease a paper and lay them on; bake in a gentle oven. By the 1890s, coconut macaroons appear in many American cookbooks, and rapidly become popular as a Passover food for Jews since they don’t contain flour. Matso manufacturers like Streit’s and Manischevitz began selling almond and coconut macaroons for Passover in the 1930s, and coconut macaroons became the best-selling flavor or version in America. Just after coconut macaroons first appear in American cookbooks, the French have their own aha moment. Macarons, at that time, were often sold in pairs with the flat sides together. A Parisian baker (Claude Gerbet and Pierre Desfontaines both claim credit) had the idea of creating a sandwich cookie by putting almond paste or ganache between the two individual macarons. The new cookie was called “le macaron parisien” or “le macaron Gerbet” and was quickly popularized by Desfontaines’ cousin, who owned the pastry shop and tea salon Ladurée. Today both the macaron parisien and versions of the traditional single macaron are popular in France. Our recent obsession with macarons, like the earlier fad for pasta immortalized in Yankee Doodle, reminds us that great food traditions are often created at the borders between cultures, as we borrow and adapt the recipes of our neighbors.